Are you looking for a Property Manager? The Richard Beckman Realty Group, LLC Property Management has the most competitive property management fees in Shelton and/or Mason County & Thurston County Washington. We charge a $300 tenant placement fee. Monthly charges are 10% of the monthly rent. Have more than one unit to managage? ASK about our MultiUnit Discount. 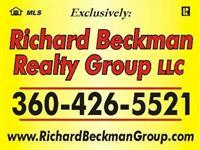 The Richard Beckman Realty Group, LLC Property Management Commitment to Service. We drive by and physically inspect your units on a monthly basis. We perform a quarterly interior inspection to make sure your unit is maintained. Click Here here to search for Rentals. Click Here for the Law of Agency.